Aha. Floyd Norris reminds us of the 23-economist letter from 2010, warning of dire consequences — “currency debasement and inflation” — from quantitative easing. The signatories are kind of a who’s who of wrongness, ranging from Niall Ferguson to Amity Shlaes to John Taylor. And they were wrong again. But that won’t diminish their reputations on the right, even a bit. How do I know that? Well, also on the list — presumably because they asked him to be there — is Kevin Hassett, co-author of Dow 36,000 and also a prominent denier of the existence of a housing bubble. Fool me once, fool me twice, fool me yet again — hey, never mind. John Holbo has a fun post about the old H.G. Wells-based movie Things to Come, which embodied a vision of the future that used to be quite popular among intellectuals — that of a temporary dictatorship, not of the proletariat, but of the scientifically literate meritocracy, which would give way to liberal democracy — plus some truly terrible fashion choices — once the masses had been sufficiently educated. Actually, you could say that something like this vision is still popular in elite circles; instead of envisioning Raymond Massey enforcing peace through air supremacy, they would have Michael Bloomberg enforcing budget discipline through bipartisan commission, but the spirit of the thing is the same. As it turns out, the second vision is proving as far off base as the first. But surely you can’t discuss all this without referencing George Orwell’s Wells, Hitler, and the World State. It’s a short essay, and the perfect corrective to any notion that technology automatically leads to social or political progress. I’ve suggested on a number of occasions that one good way to understand the problems of the euro is to compare the experiences of Florida and Spain. Both had huge housing bubbles, fed in part by buyers of coastal holiday homes, which burst. Both suffered nasty recessions as a result. But then their destinies diverged, because one was part of a fiscal as well as monetary union, while the other wasn’t. As its economy shrank, Florida paid much less in federal taxes, even as federal spending in Florida rose; I’ve estimated the de facto federal aid to Florida in 2010 at around 5 percent of GDP. That’s aid, not loans; anything on that scale would have been inconceivable in Europe. Now, as everyone knows, Spain continues to suffer, with unemployment rising ever higher; and despite ECB actions that have contained its borrowing costs, no end to the debt crisis is in sight. Meanwhile, what’s going on in Florida? 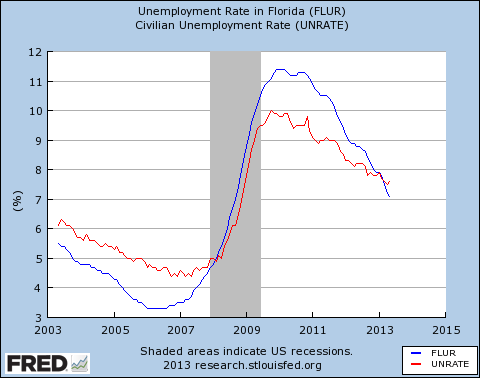 What has happened, presumably, is out-migration: workers leaving Florida for better job markets. Oh, by the way: further evidence against the notion that “structural” mismatches explain weak employment. Now, out-migration is a big problem when it happens in Europe, because it undermines the fiscal base; but in Florida, which benefits from federal retirement and health-care programs, housing the elderly is actually an export industry. So the saga continues — and the evidence continues to mount that Europe just wasn’t ready for a single currency. I promised in an earlier post to say something about why these days I tend to get annoyed when I hear the phrase “structural reform”, especially in Europe. Part of the reason is that the phrase sounds good, but could mean lots of things. In many cases “structural reform” is code for eliminating worker protections and/or sharply cutting social benefits. Sometimes this may be necessary — let’s face it, France has made it much too attractive to retire at 55 — but such things should be called by their proper names, not wrapped in vague language that conceals the nature of the pain. That brings me to a second problem: whenever some catchphrase becomes part of what Very Serious People say because it sounds Serious, it’s time to stop using the phrase, to force the VSPs to talk about what they really mean. In the US context, “entitlement reform” is VSP boilerplate — I mean, who can be against reform? But there’s a world of difference between trying to move away from fee for service medicine — a reform I support — and, say, raising the Medicare age, which would be a terrible policy. These things should not be lumped together. But the main thing about “structural reform” in Europe is the role it plays in discussion of macroeconomic policies. Instead of reflecting on the fact that Europe is sinking deeper into depression five years into the slump, and clearly needs less austerity and more aggressive monetary expansion, the usual suspects start talking about the need for structural reform. And my sense is that this talk of reform has, in practice, become less a real demand for specific actions than an excuse for not facing up to the reality of macroeconomic disaster, and a way to avoid discussing the responsibility of Germany and the ECB, in particular, to help end this disaster. Simon Wren-Lewis has been on a roll lately; his latest talks about how the mishandling of Greece inflicted vast damage on the European economy as a whole, and to some extent the US economy too. Basically, troika officials refused to admit the obvious and allow an early Greek default; instead they made absurd claims for the effectiveness of austerity, and in so doing spread austerian economics far and wide. Cardiff Garcia has a nice survey of the two main groups of stimulati — those who want policy makers to be doing much more in the way of fiscal expansion, and those who want much more in the way of monetary expansion. As he says, most (but not all) of the players here are, as a practical matter, OK with trying both, so in policy terms there isn’t much argument between them. I’d just add two points. First, my own evolution: in 1998, looking at Japan, I concluded that monetary policy could be effective, but only if — in what I guess is now a widely used phrase — the central bank could credibly commit to being irresponsible, that is, to allowing inflation to rise, not tightening money as soon as the economy recovered. When crisis struck more widely, it became clear to me just how hard this would be to achieve — in part because it would obviously take years to persuade central bankers that they needed a higher inflation target, and further time to convince investors that the central bankers really had changed their spots. So I became a pragmatic fiscalist, for reasons best laid out by Mike Woodford: the great thing about fiscal stimulus is that it doesn’t depend on expectations, and it works even if nobody believes it will work. Unfortunately, this pragmatic case for fiscal policy runs into a different real-world problem: the obduracy of policymakers, who quickly turned to austerity policies, reaching for any argument they could find. This has led me and others to spend a fair bit of time calling for monetary expansion, simply because the central bank retains some freedom of action. Second, I’m surprised that Garcia doesn’t mention Richard Koo, who would seem to be the prime candidate on the fiscalist side for someone who is adamant that we not try monetary policy on the side. I’ve written about my puzzlement over Koo’s position. The main thing, I think, is to recognize that while we have our differences, the important thing is to try everything that might help. The greatest intellectual sin here is to care more about protecting your turf — my answer is the only answer! — than about the real economy that desperately needs every form of help we can deliver.